(a) The path AB of the packet is shown in the following figure. The path is parabolic. (b) The packet will not move up initially. 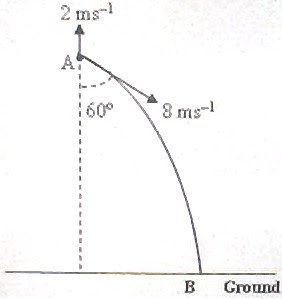 This is due to the fact that the vertical, downward component (8 cos 60º = 4 ms–1) of the velocity with which the packet is thrown down is greater than the upward velocity (2 ms–1) of the chopper. [The situation is as though the packet is thrown down from a stationary chopper with vertical (downward) velocity component (4 ms–1 – 2 ms–1) = 2 ms–1 and horizontal velocity component 8 sin 60º = 4√3 ms–1]. 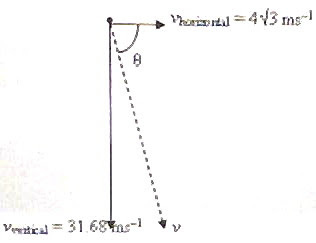 s = ut + ½ at2 where the vertical displacement s = 50 m, vertical (downward) velocity component u = 8 cos 60º – 2 = 2 ms–1 and vertical (downward) acceleration a = g = 10 ms–2. Therefore, 50 = 2t + ½ ×10t2. This gives t = [–2 ± √(4 – 1000)] /10 = 2.968 s.
(d) The horizontal distance R traveled by the packet before hitting the ground is the product of the above time and the horizontal velocity component vhorizontal which is equal to 8 sin 60º (= 4√3 ms–1). Therefore, R = 2.968×4√3 = 20.56 m.
vvertical = uvertical + at where uvertical is the initial vertical component of velocity, a is the vertical acceleration and t is the time of flight of the packet. Here uvertical = 8 cos 60º – 2 = 2 ms–1, a = g = 10 ms–2 and t = 2.968 s.
Therefore, vvertical = 2 + 10×2.968 = 31.68 ms–1. v = √[(4√3)2 + (31.68)2] = 32.43 ms–1.